Being able to drive off to a perfect slice of the country over the weekend can become a great adventure or a relaxing rest. This can be enhanced with an exciting bike ride, either alone or with the whole family. To do this, you need to attach a bike rack to your vehicle, before driving off into the sunset. Some bike racks are great for the lone rider while other bike racks are strong enough to transport your whole family’s bikes. We have reviewed ten of the best bike racks currently available on the market, enabling you to decide which bike rack is the best for you and your needs. The Allen Sports Deluxe Hitch Bike Rack provides a 2-inch trailer hitch and is capable of fitting three bikes, enabling you to fit your bike and your children’s bikes easily and offering you the chance to enjoy family bike rides. The carry arms feature a 16-inch length, perfect for ensuring that your bikes are safe and securely stored. 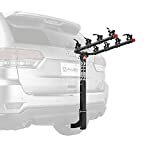 Additionally, you can quickly install the bike rack within minutes, aiding further ease of use when folding and storing away in your home, or in the trunk of your vehicle. Made from strong steel, the bike rack is tough and durable and offers a stylish black powder finish. To ensure peace of mind, the bike rack comes with a lifetime warranty, providing a strong purchase for your needs. 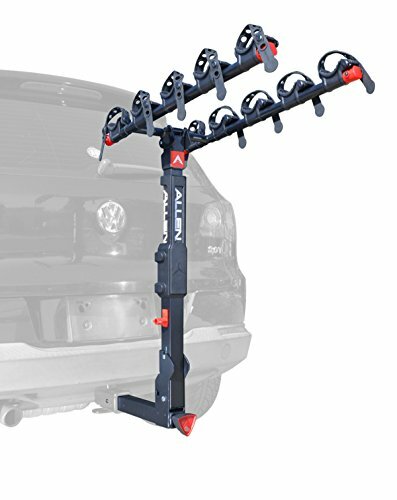 The Allen Sports Deluxe Hitch Mounted Bike Rack provides dimensions of 25 x 4 x 18 inches and weighs approximately 6.8 kg. Why We Liked It – Being able to carry three bikes ensures that the Allen Sports Deluxe Hitch Mounted Bike Rack fits in with your family life, enabling you to easily take your family on a bike ride through the country. Additionally, the black powder color looks great against your vehicle while the easy installation and easy storage ensure that the bike rack is a great purchase. Furthermore, the lifetime warranty makes this bike rack a must-have purchase and great value for money. The Allen Sports Deluxe Trunk Mounted Bike Rack holds two bikes, perfect for venturing on a couple’s ride across a weekend. Being a perfect fit for hatchbacks, sedans, SUV’s and minivans, the attached side-straps ensure that your bikes receive lateral stability and a secure fit. Security is enhanced through the separate tie-downs in addition to the padded lower frame, ensuring that your bikes are safe and that your vehicle is not scratched. The long arms ensure a 12-inch reach, accommodating a wide range of bicycles. The Allen Sports Deluxe Trunk Mounted Bike Rack weighs 7.5 lbs and offers dimensions of 23.5 x 13 x 4 inches, providing a sleek black color design. Furthermore, the lifetime warranty provided with the bike rack offers a worthwhile purchase. Why We Liked It – The separate tie-down straps and the padded lower frame provide the additional security and peace of mind required when using a bike rack, ensuring that your bikes, your vehicle, and more importantly your family, are safe traveling on the road. The lifetime warranty which is provided when you purchase the Allen Sports Deluxe Trunk Mounted Bike Rack is also a fantastic feature. The Allen Sports Ultra Compact Trunk Mounted Bike Rack features a strong and durable steel design, suitable for carrying one bike for when you want to venture independently across the country. Offering easy use and the ability to store within the trunk of your vehicle, the bike rack folds functionally and can even fit within most backpacks to aid your commuting journey. Featuring three padded legs to protect your vehicle from scratches, this bike rack will fit SUV’s, hatchbacks, sedans, and minivans. Additionally, three separate straps ensure full security for your bike, enabling the tie-downs and padding to work together to ensure that both your bike and vehicle are safe. Furthermore, a carry bag is included with your purchase, providing a commuter-friendly product. The Allen Sports Ultra Compact Trunk Mounted Bike Rack weighs around 6.53 lbs and provides dimensions of 7.3 x 3.5 x 14 inches. Why We Liked It – The Allen Sports Ultra Compact Trunk Mounted Bike Rack is perfect for a lone rider who requires a bike rack for the daily commute, coming complete with a carry bag for easy use or you can simply carry your bike rack inside of your backpack. The Yakima Products Ridgeback Bike Rack is available as a five bike rack, capable of transporting the whole family’s bikes as you venture towards your holiday. Featuring a tool-free locking SpeedKnob system, the bike rack enables easy and quick installation as you fit the device onto your vehicle. Additionally, the upper hand lever tilts the rack downwards for quick access to your vehicle. Furthermore, the Yakima Products Ridgeback Bike Rack ensures that the product can fold down flat for great storage, enabling you to store the bike rack away into your vehicle trunk or in your home garage. The Zip Strips ensure that the bike rack is secured to your bike, with anti-sway cradles offering the assurance that the bikes will not reach contact with each other. 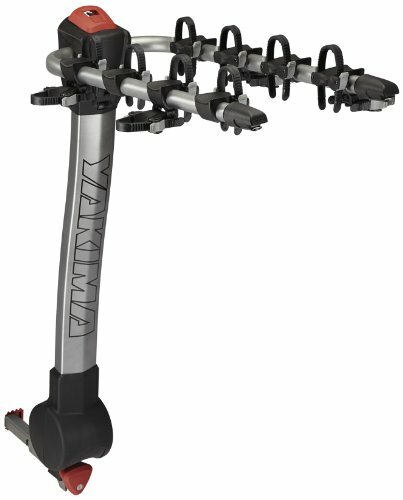 The Yakima Products Ridgeback Bike Rack weighs around 39.7 lbs and provides dimensions of 48 x 15.2 x 12.8 inches. Why We Liked It – Being able to fit and secure five bikes is a perfect feature of the Yakima Products Ridgeback Bike Rack, enabling you and your family to journey out onto a bike ride or adventure holiday and share some great memories. The additional security features of the bike rack ensure that all of your bikes are safe and fixed properties. 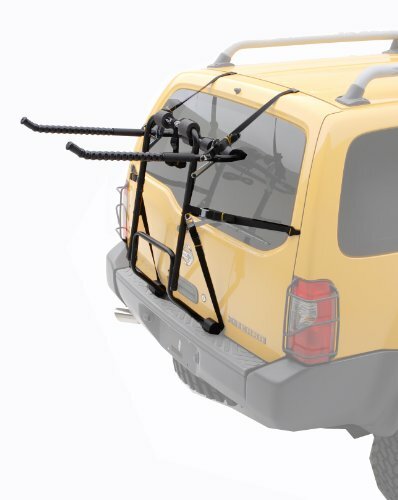 The Hollywood Racks F4 Heavy Duty 4-Bike Trunk Mount Rack enables you to store four bikes to the back of your vehicle, being suitable for SUV’s, vans and most cars. Featuring the ability to fold flat for easy storage, the bike rack comes fully assembled and even features a day glow safety flag for added peace of mind. The bike rack is made from heavy-duty steel tubing to ensure durability and a tough frame, providing a maximum weight capacity of 35 lbs per bicycle, or 140 lbs in total. The Hollywood Racks F4 Heavy Duty 4-Bike Trunk Mount Rack weighs a total of 17 lbs and provides dimensions of 6.3 x 31.7 x 21.4 inches. Why We Liked It – The Hollywood Racks F4 Heavy Duty 4-Bike Trunk Mount Rack enables four bikes to be transported at once, while all safety features are enhanced by the day glow safety flag. The tough material is strong enough to carry a great deal of weight, while the design folds flat for easy storage. 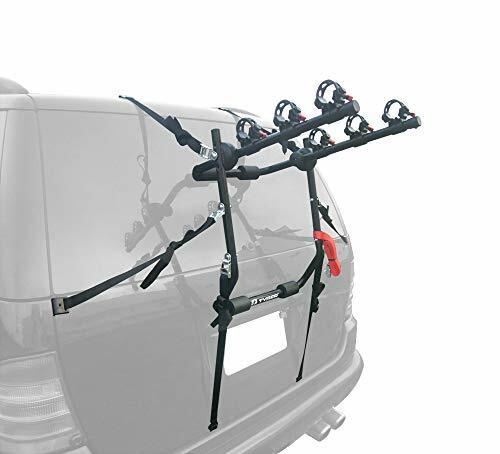 The BV Bike Bicycle Rack Carrier provides storage for two bikes, allowing yourself and a partner to explore the country and embark on adventures. The tilt-back design provides you with the ability to open the rear gates while maintaining the integrity of the hitch rack. A rear safety reflector is included with the bike rack, providing the best safety features and enabling high visibility even during the night. A two-way anti-wobble system enables the bike rack to remain stable and reduce movement between the rack and the hitch when in motion. Padded arms help to protect your vehicle and your bike, ensuring that the possibility of unwanted scratches is eliminated. Security is deepened through the tray-style loops to ensure that your bike is placed firmly within the rack. The maximum load per bike is 35 lbs or 70 lbs in total. Why We Liked It – The two-way anti-wobble system is a patented feature of the BV Bike Bicycle Rack Carrier, providing security for your bike and protecting your vehicle. Additionally, the tilt-back design provides an ease of use desired from this bike rack. The MaxxHaul (70210) 4-Bike Deluxe Rack is suitable to store four bikes, fitting 2-inch receivers. Being manufactured from durable and tough steel, rigid construction provides additional strength for everyday use. Features include an adjustable bike cradle complete with a hook and loop straps for the highest level of security and safety. However, this bike rack is not suitable for use on RV’s and does not hold bikes which feature slanted bars. A built-in reflector increases safety levels, and the powder coat finish ensures that your bike rack remains rust-free. The MaxxHaul (70210) 4-Bike Deluxe Rack weighs around 26.1 lbs and possesses dimensions of 33 x 10 x 6 inches, holding a maximum weight capacity of 150 lb. 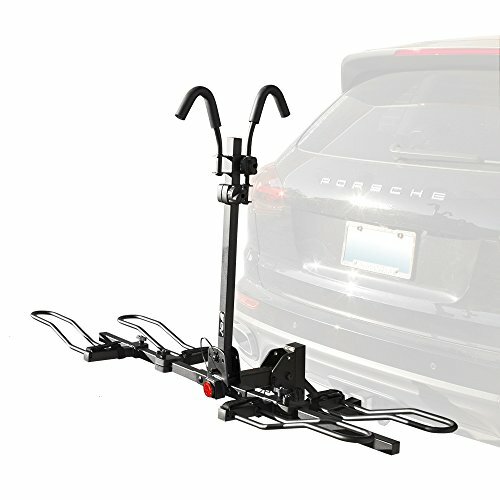 Why We Liked It – Featuring a built-in reflector, the MaxxHaul (70210) 4-Bike Deluxe Hitch Mount Rack features good safety features for a bike rack, ensuring that you, your vehicle and your bikes are safe and secure at all times. Be careful that your vehicle and your bikes are suitable for this bike rack, however, as the rack is not suitable for RV’s and cannot hold slanted bikes. The Tyger Auto TG-RK3B203S Deluxe 3-Bike Trunk holds three bikes and is suitable for almost all SUV’s, minivans, sedans, and hatchbacks. A durable and sturdy frame ensures the strength required for holding three bikes, while the padded lower frame protects your vehicle and ensures that your paintwork does not suffer from any scratches. Furthermore, the frames of your bikes are protected and secured with the inclusion of separate soft cradles. Additionally, the frame is coated in OE standard black E-Coating which ensures that regardless of the weather, your bike remains rust-free and looks great. Furthermore, this bike rack is easily installed and assembled, providing you with worry-free usage. The Tyger Auto TG-RK3B203S Deluxe 3-Bike Trunk weighs only 3 lbs and possesses dimensions of 25 x 4 x 3 inches and additionally comes with a lifetime warranty. Why We Liked It – Acquiring a lifetime warranty is a fantastic bonus of Tyger Auto TG-RK3B203S Deluxe 3-Bike Trunk, providing you with peace of mind that your bike rack will possess longevity and that you are receiving value for money. 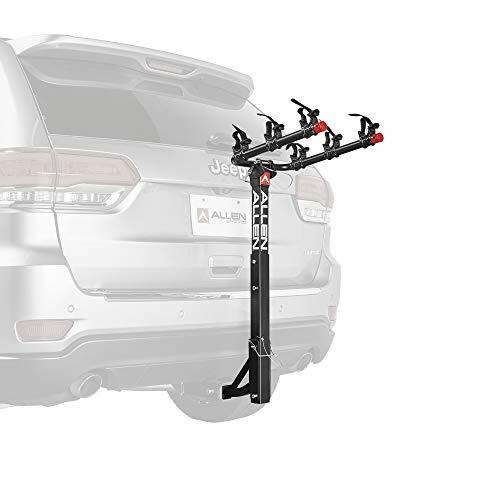 The Allen Sports Premier Bike Rack for cars enables you to store three bikes on the back of your car and features a 1.25-inch hitch. The quick set carry-arms allow easy use, snapping back into place once you have removed the bike. Furthermore, the dual compound tie-down cradles ensure that your bikes are secure and protected, enhanced by the quick set straps so you can drive to your destination safely in the knowledge that your bikes are secured. The internal tilt-away release provides easy life gate access while the no-wobble bolts ensure that your bikes remain in place and that there is no movement of the rack inside of the hitch. Additionally, an integrated locking loop features, in addition to a rapid tilt-away mast, providing all of the best functions and features which you could desire in a bike rack. 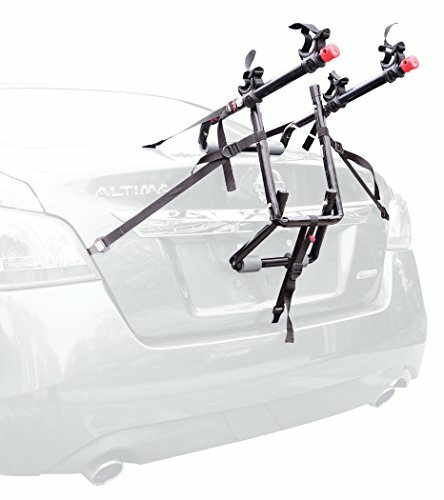 Why We Liked It – The snapping action of the quick set carry-arms is a functional and desirable feature of the Allen Sports Premier Bike Rack, in addition to the no-wobble bolts, ensuring that you gain the most out of your bike rack for the benefit of your bike, your vehicle, and yourself. 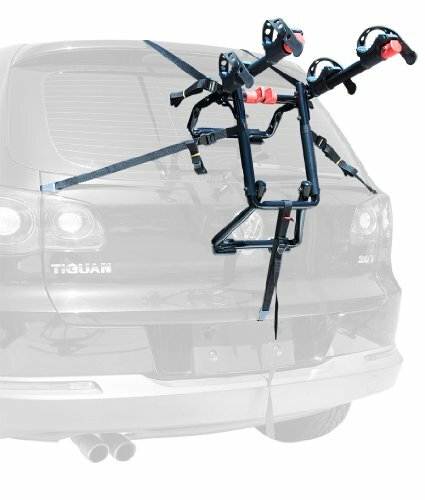 The Allen Sports Premier Trunk Mounted Bike Rack is suitable for transporting two bikes, being the perfect fit for hatchbacks, SUV’s, sedans, and minivans. A patented quick snap set-up design ensures that you can quickly set-up the bike rack as soon as your purchase arrives, providing minimal effort. The 12-inch carry-arms enables a maximum carrying capacity of 70 lbs, while the individual dual-compound tie-down cradles secure the bikes efficiently. Two patented straps secure the lower section of the bikes, ensuring that the bottom hooks remain in place on the road. Furthermore, the extra large car pads protect your vehicle from scratches, while the narrow set carry-arms are perfect to fit a broad range of bikes. The Allen Sports Premier Trunk Mounted Bike Rack weighs around 11 lbs and possesses dimensions of 5.1 x 23.6 x 14.2 inches, and additionally offers a lifetime warranty with each purchase. 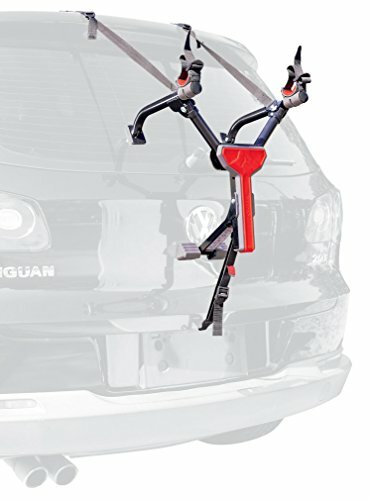 Why We Liked It – The Allen Sports Premier Trunk Mounted Bike Rack provides some great features, some of which are unique to the Allen brand and are patented to the company. 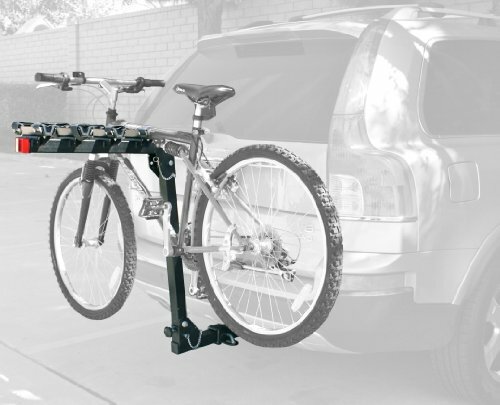 The patented quick snap set-up allows you to snap the bike rack from the folded position to the assembled position, aiding easy use and allowing you to easily assemble the bike rack before every use after being stored in your garage or in the vehicle trunk. Furthermore, the patented lower straps ensure that the bikes are fully secured, providing the highest levels of safety for you and other road users. A bike rack can be an excellent addition for your vehicle, enabling you to cycle for part of your daily commute, or journey to the country for a relaxing ride, or take the whole family on a bike riding holiday. You may even enjoy taking your bike to a competitive race. If you are thinking about purchasing a bike rack, you will need to consider the size of the bike rack which you need along with the compatibility with your vehicle. Other considerations include ensuring that your number plate is not obscured once the bike rack and your bikes are fitted to your vehicle, in addition with adhering to state laws and regulations such as the need to add a lighting board. You should consider what you will use your bike rack for before purchasing the correct item. If you will be transporting only one bike, then there are some great commuter-friendly bike racks on the market which can fold small enough to fit inside your backpack. Some even include a carry bag for easier use. If you and a friend or partner will be embarking on cycling journeys, then you will need a two-bike rack, capable of transporting you both on exciting adventures in the country. Alternatively, if you and your family desire a cycling holiday, then many bike racks available can hold four or even five bikes at once, ensuring that no one misses out on the fun. Q: Can all bike racks fit all vehicles? A: No, it is important to check the manufacturer’s instructions of the bike rack to assess suitability. Most smaller bike racks will fit almost all vehicles, but the larger bike racks which carry four or five bikes may require a large vehicle in order to support them. Ensure that your bike rack is the perfect fit in order to adhere to safety standards and get unlimited use form your purchase.